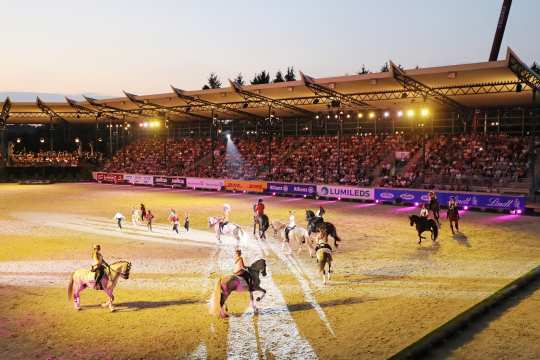 “The demand for tickets is already so high that we are pleased to accommodate the wishes of our visitors by offering an additional venue date,” Frank Kemperman commented regarding the “Horse & Symphony” concert at the CHIO Aachen 2019. The Show Director is promising a spectacular show programme accompanied by the live music of the Aachen Symphony Orchestra. As a result of the additional venue date on Friday evening, July 12th, 2019 tickets are available for the show again. Apart from a few odd remaining tickets, the Saturday is already sold-out. From 8.30 p.m. onwards on both evenings there is going to be a very special atmosphere in the Deutsche Bank Stadium again. Because when the evening sun goes down behind the stands, there is an impressive and emotional ambiance. Top international equestrian sport is on the programme as well as fast-paced show performances. The participants and horses will be accompanied by the Aachen Symphony Orchestra under the direction of the General Music Director, Christopher Ward. This July is going to be Ward’s first “Horse & Symphony”, the British conductor is already extremely looking forward to it. The demand for tickets for the “Horse & Symphony” concert is traditionally very high, which is why the organisers are offering an additional event again in the year 2019. The tickets cost 39 Euros and can be ordered online the hotline on +49-(0)241-917-1111. They can of course also be purchased from the offices at the CHIO Aachen showgrounds. "Horse & Symphony": Impressive show in the Deutsche Bank Stadium at the CHIO Aachen. Photo: CHIO Aachen/Andreas Steindl.